So, my solution is to add MEANINGFUL and PURPOSEFUL play throughout our day that isn't just fluff. I figure I have to teach these standards anyways, so I might as well inspire and motivate my students to learn in the process! Sidenote- This post contains links to my favorite products and materials. These affiliate links provide me with a small commission, at no extra cost to you, should you purchase something through them. BUT, as always, I promise to never share something that I do not absolutley love using in my own classroom. Now, on to the good stuff! I have a ton of different food themed activities that I add in to my daily centers and whole group activities throughout the week. But occasionally, I love to create a whole special day dedicated to a theme and just run wild with it. 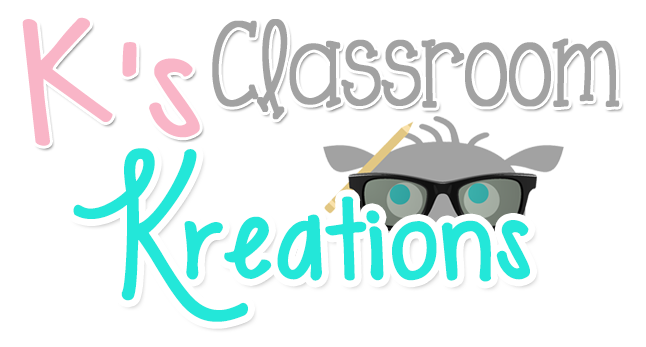 The goal is to create a fun space and experience without breaking my teacher budget or staying at school until midnight! For this Pizza Day I simply gathered up a few of my favorite pizza themed activities, bought red tablecloths from the dollar store, and created a Pizza Shop sign. To make the sign I just opened a PowerPoint document, added the saying "Sophia's Pizza Palace" in a cute font, and inserted my favorite clipart. Then, I used my smart board to trace it all onto thin foam board and colored it in. PS. I don't know who Sophia is....the kids picked it! Ha! 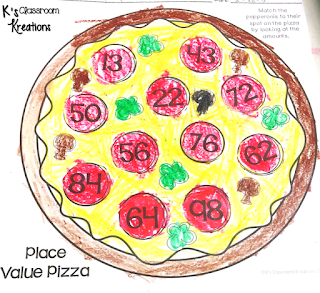 We spend about 3 weeks learning all about place value in my first grade classroom and this activity is always a hit. 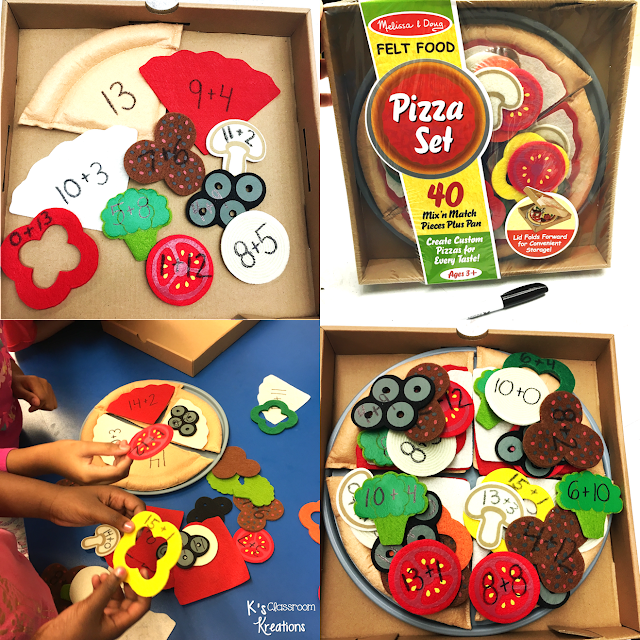 The matching game, pizza center, and craft are all a part of my Place Value Pizza set in my Teachers Pay Teachers store. My students learn to recognize base ten blocks and values by matching cards. Sometimes we use the cards to play memory or Go-Fish if we are looking to spice things up. I also save old frozen pizza boxes to put these laminated pizzas into- can we say yummy? My kids match the toppings to the correct pizza. Since my firsties ALWAYS seem to mix up sets of pieces if I set out more than one center, I either color code or label the pieces with a letter so my "Materials Manager" can help me sort it out when we are finished. Their favorite part of this activity is the craft. 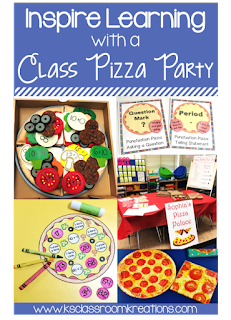 I have a few different versions of the page so if I create a bulletin board with the pizzas it has some variety. 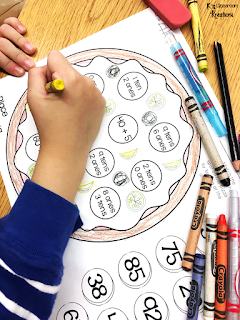 My kids just cut, color, and paste their pizzas together after looking at the tens and ones. Another major skill in first grade is addition and subtraction. 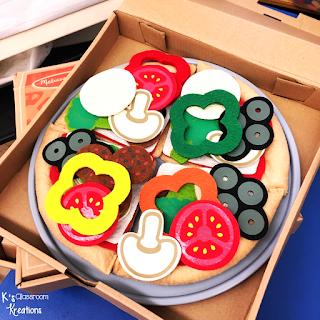 I buy a couple of felt pizzas and turn them into our own games. You can also find them at AC Moore and use a coupon and teacher discount to save some money. I write numbers to 20 to write on each slice of crust using a black sharpie. 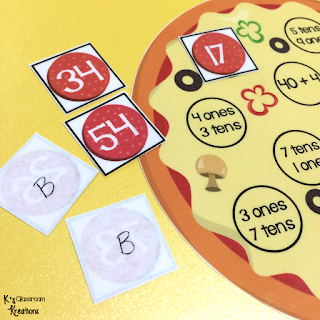 Then I add math equations to each topping so students can put it onto the correct slice once they solve the problem. 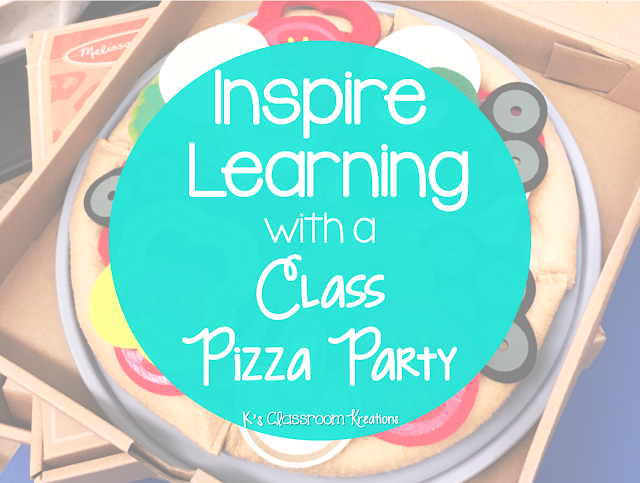 They LOVE playing with the pizzas so much sometimes they take them out as an early finisher activity, which of course works for me! I save one or two of my felt pizzas to create Fran's Fraction Restaurant. I make an anchor chart listing each topping like a menu. You can see part of the anchor chart in the top picture when I showed the room. Then, I drew a picture of a WHOLE, HALF, and QUARTER circle filled in. One student stands behind the table as the chef, and the other is the customer. The customer orders a pizza with the toppings of their choice, being sure to use fraction words. For example " I would like the whole pizza to have sauce, half to have cheese, one quarter to have olives, and 3 quarters to have pepperoni." The chef "cooks" up their pizza and then they switch places. I was also able to find little chef hats online made out of tissue paper and a sentence strip that worked well for the experience. Since I can't just work on math skills all day, I also add the theme into our writing lessons. 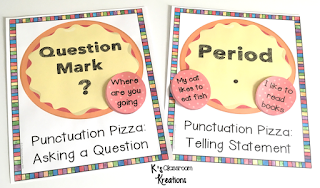 My kids always need more practice with punctuation so I write sentences out on pepperoni slices (or you could use red construction paper). After reading the sentences they decide if it needs a period or question mark and put it on the correct pizza. 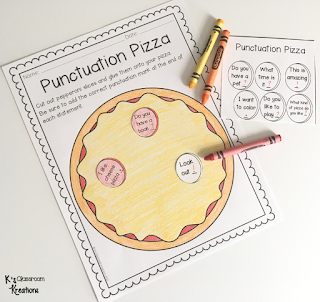 Of course, I love meaningful crafts (that I can also use as a quick check of their understanding) so we add in their own Punctuation Pizza. Our final (and favorite) part of the day is our Opinion Writing activity. If the cafeteria served pizza we discuss if they chose cheese or pepperoni. Sometimes I will have a parent volunteer send in pizza or will buy it myself, depending on what is feasible at the time. Remember, the kids don't care how they get pizza...they just want to to eat it! Don't feel like you need to skip your own groceries for the week buying it. We discuss different types of pizza and the reasons why they like each. I staple blank paper inside of these pizza themed napkins (from Walmart) and we turn those into Napkin Books. The decorative napkins becomes the cover of their book. My students write their opinion paragraphs inside stating their opinion, reasons, and finish by restating their opinions. - Pizza Erasers- Target has the cutest pizza themed erasers (if you are lucky enough to find them!) that could be used a math manipulatives or counters to solve word problems. 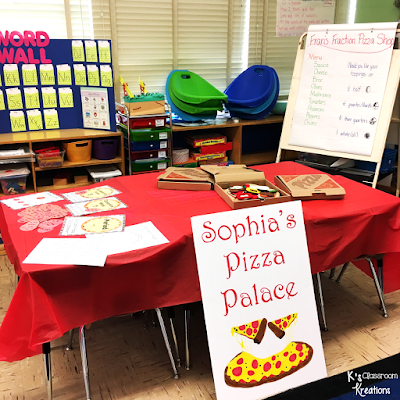 - How to Writing- You could buy the mini pizza crusts/english muffins, sauce, and cheese and have students write their own step by step directions on how to make a pizza. If you are allowed to bring in a toaster oven you could make it in your classroom, or work the the cafeteria staff to have them bake them for you. 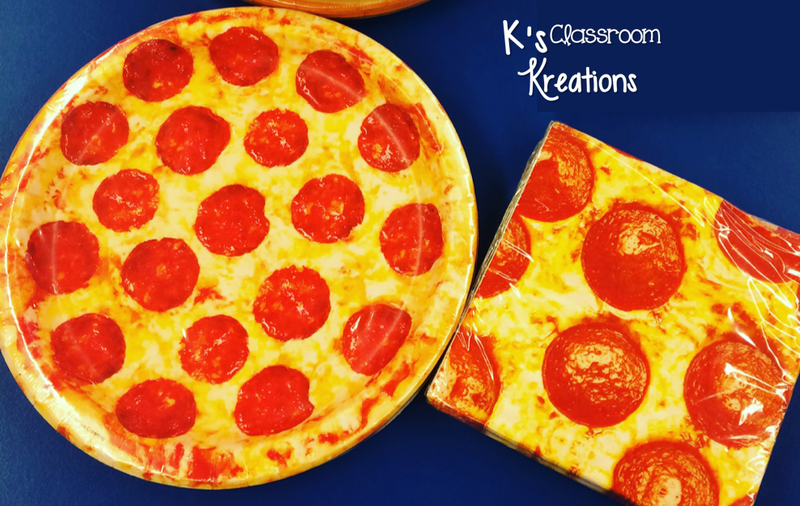 - Shape Pizza- You could review shapes by having your kids create a round pizza, circle pepperoni, triangle cheese slices, etc. out of construction paper. - Restaurant- Practice speaking and listening skills (along with manners and life skills) by pretending to be at a restaurant. How do you order politely? Which toppings would the customer want? The "waiter" could relay the message to the cook. 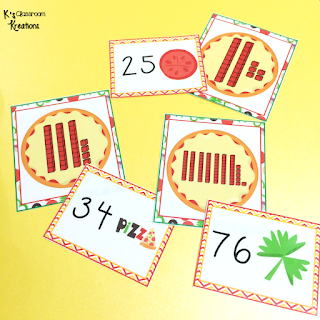 You could also add prices to different toppings and practice writing a receipt and adding up totals. 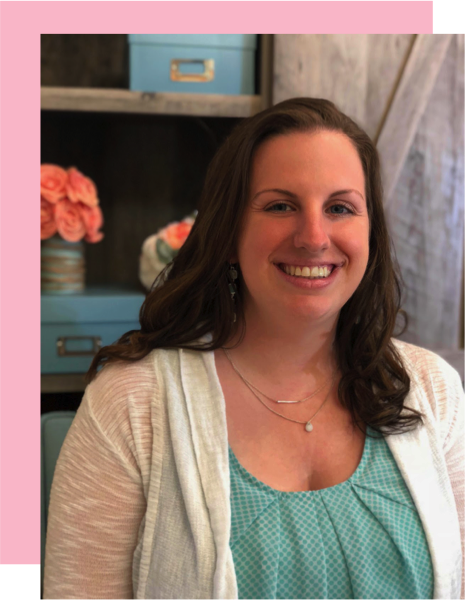 - Pizza Themed Read Aloud- You could read a Pizza Themed book (here are a few of my favorites) and practice retelling the story, identifying story elements, or looking for a lesson to be learned. Have you had a Pizza Day before? What activities did you do that made learning extra fun?